Hope you enjoy my first full review ever. Thankfully you’ll notice this is 100% a completely honest and non-biased review. Just because I purchase models from a certain brand doesn’t mean I’m going to ignore everything that is wrong with it just to feel better. 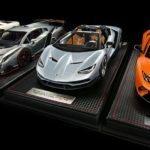 All collectors should be honest when reviewing a model because thanks to this reviews other collectors will decide to purchase or not certain models. This is a serious hobby which involves lots of money, at least for the collectors like me who are not millionaires. You know that feeling when you open the box of your brand new model and it wows you immediately? 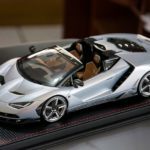 This is definitely the case with this 1/18 Lamborghini Centenario LP770-4 Roadster by MR Collection Models. I probably fell in love with it before even removing the display case. Probably the reason why I immediately fell in love with this model. It’s definitely one of MR’s best efforts when it comes to paint jobs. 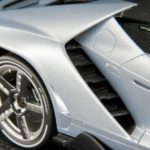 Have you seen pics of the real car, how in some pics it looks blueish but in other pics it’s almost completely silver? It’s the exact same case with this 1/18. 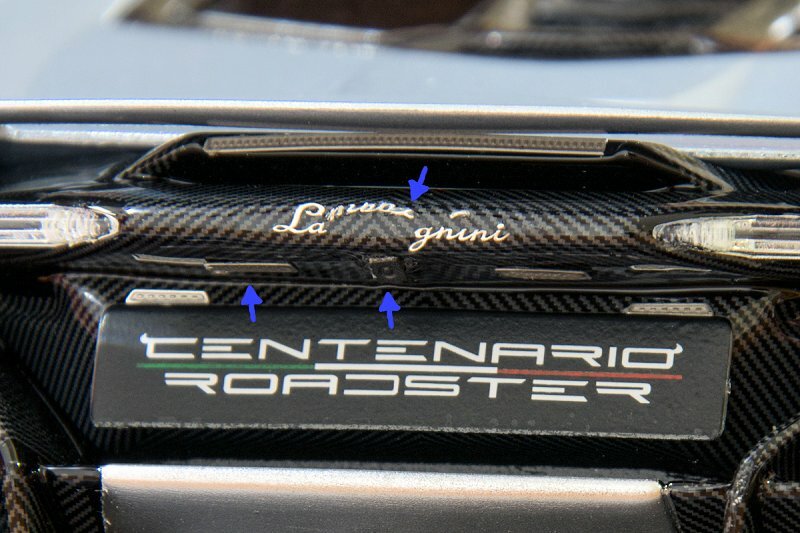 The color “Argento Centenario” is just gorgeous replicated. With direct light it definitely looks blueish while most of the times it looks silver. I love how it’s not completely matt but it has a satin finish with kind of a metallic look, a little bit hard to explain, but it definitely does justice to the real car. MR, why don’t you give a satin finish look to your Nero Nemesis color just like the real car? Stop making it 100% matt, it looks awful. 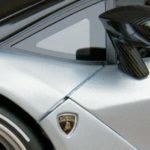 The headlights of the real car are seriously detailed, for sure very hard to replicate in 1:18 scale, sadly it shows on this model how MR had a hard time with them because they’re definitely not as good. * The “Light Design” logo is completely missing. * The nice texture in front of the bulb is also missing. * The small LEDs are not separated pieces, in fact those LEDs are actually a single molded piece and painted in black. * The Y shaped light is not their best effort either. 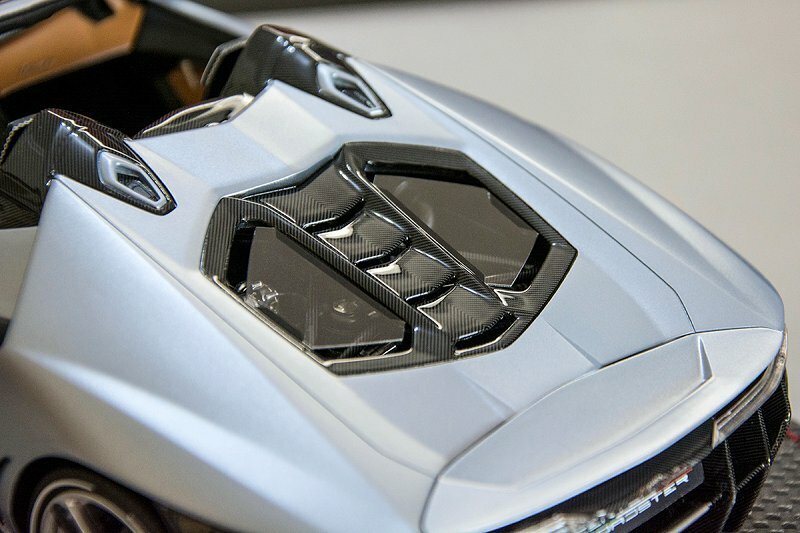 For sure I don’t think a brand like AUTOart will do a better job, they’ll probably do a lot worse, but that doesn’t mean this MR headlights are good enough. 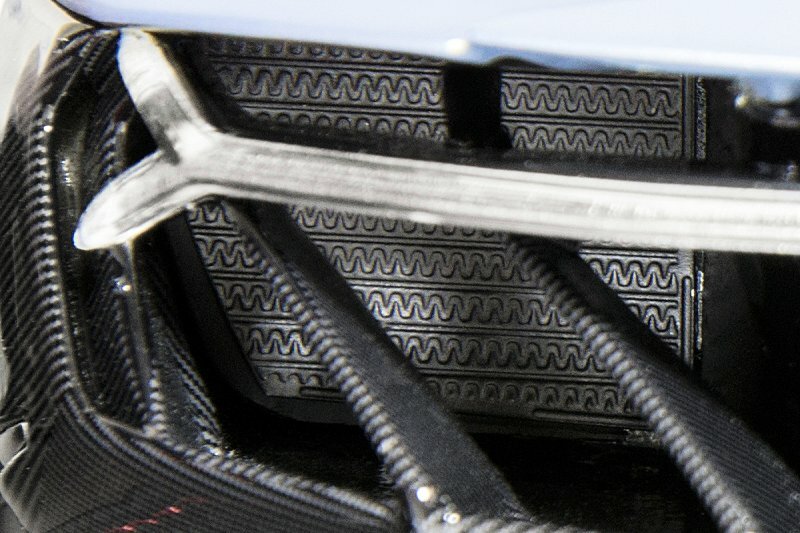 At least MR included the nice texture in front of the Y shaped light, and they’re covered in carbon fiber just like the real car. I won’t give them such a hard time with the score on this one, because indeed I can’t imagine how hard it is to replicate such headlights. 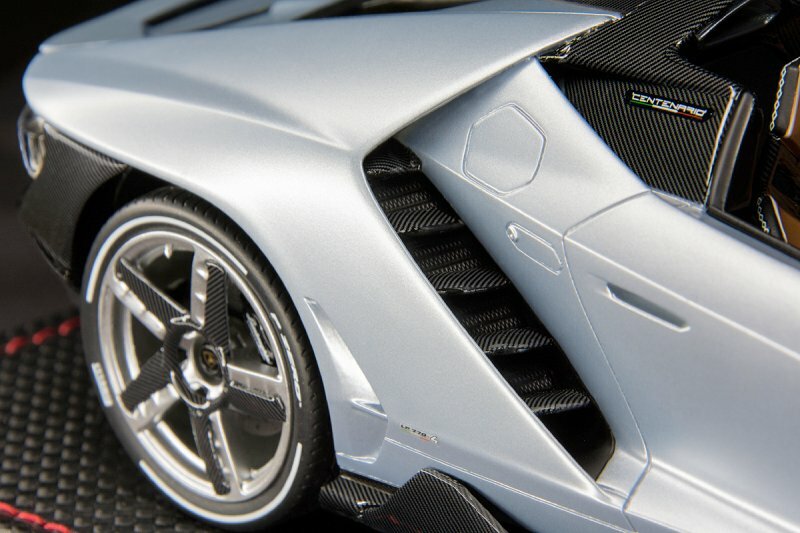 Yes I know about the “Lamborghini” script logo lol, but this is covered in the final part of this review. Not much to say here. 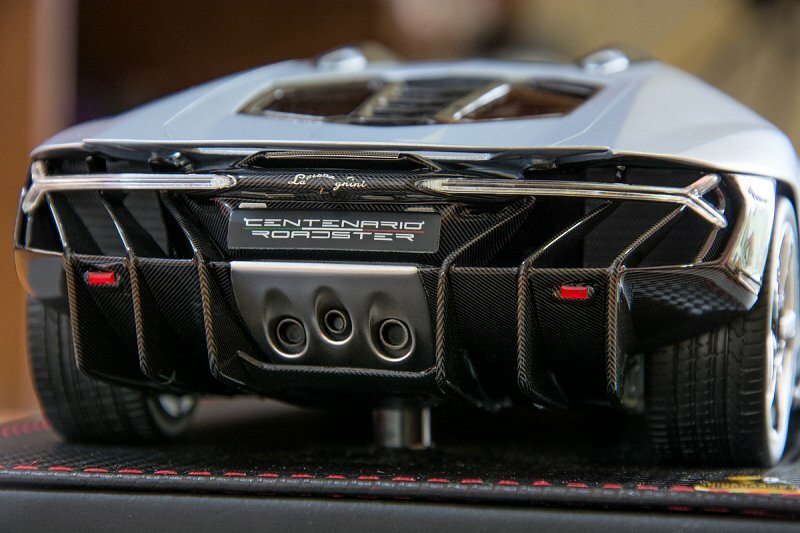 Just like the real car, the taillights are not very detailed. A good thing is that MR actually included the 2 extra brake lights that are located between the rear fins. 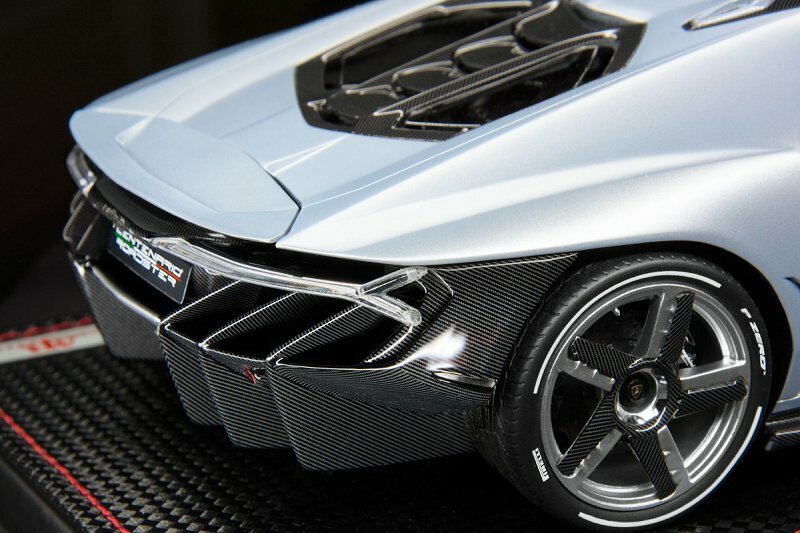 And the other extra light between the rear wing and Lamborghini logo which actually looks good. I have to say I don’t like how MR made the Y shaped lights that much, they’re a bit rough. I will give a good score, however take in mind my model came with clear taillights. The regular production version by MR comes with red painted taillights which are just absolutely wrong, so I would probably give them a very bad score if I got that model instead. This is definitely something special of the real car, you definitely don’t see exhausts like this on regular basis. MR did a good effort here, however the pipes themselves are either plastic or resin, and they could have been metal pieces but nope. Also on the silver part, just under the pipes, there should be a texture like little dots, but MR didn’t bother with this. 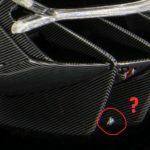 I’m so glad MR is improving their carbon fiber decals once again. Not so long ago they were using blueish decals with square pattern, it looked like checkerboards or something. 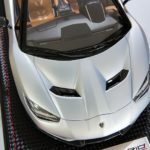 With their Veneno Roadster they improved this and started to use a proper pattern that actually looks good, but it wasn’t good enough, and the decals were still blueish. But now they have improved this massively. Pattern is perfect now, color is also perfect and not blueish in any way. It’s a proper grey and black decal. And with clear coat it looks absolutely beautiful. 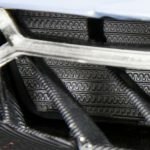 I think this looks just like BBR’s gorgeous carbon fiber, however I’ve never seen a BBR in person so I can’t confirm that. Sadly on the matt parts they don’t look that great because instead of using a matt clear coat, they simply don’t use a clear coat at all. 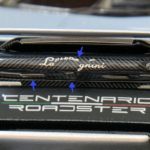 Something they should learn from Fronti-Art and their gorgeous Koenigsegg One:1 in matt blue with matt carbon fiber everywhere. 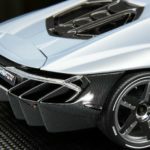 By the way, I absolutely love the fact that MR tries to scale the carbon lines correctly, not like AUTOart who will make the lines WAY too big just to cause a better impact for when you see the model from a far distance. 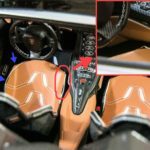 That’s not attention to detail, AUTOart! As you know, on sealed models you can’t see much of what is on the inside. However in my opinion MR did a good job here. The engine cover is fully covered with this new carbon fiber decals that MR is using now. 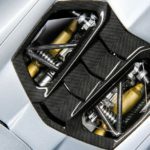 On the inside, the X shaped tubes protecting the actual engine are also covered with carbon fiber, and the tube that is on top of the suspension system is also covered with carbon fiber. 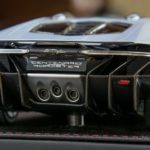 The actual engine itself which is not very visible is also covered with carbon fiber, with the V12 logo and serial number. 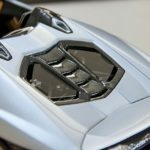 Probably it’s the same engine block from their Aventador SV, but it’s just impossible to find the right angle to capture it with the camera. 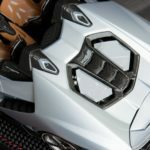 Besides that, there are details here and there, with silver, black, and gold parts around the engine. 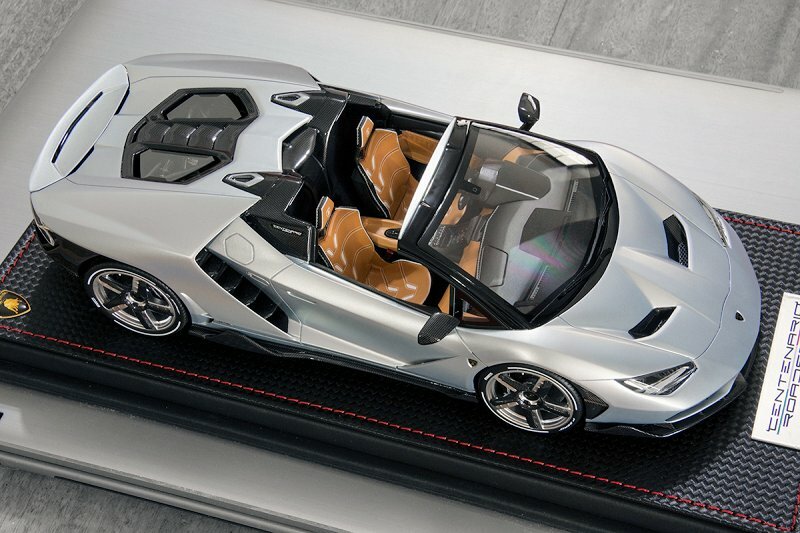 Also very visible is the suspension system, with realistic black springs, just like the real car. MR can definitely improve the engine section way more, with wires and cables around, and maybe even more pieces because somehow it feels like there’s a lot of free space. It just feels like it should be more busy. MR is not known for making great engines anyway. 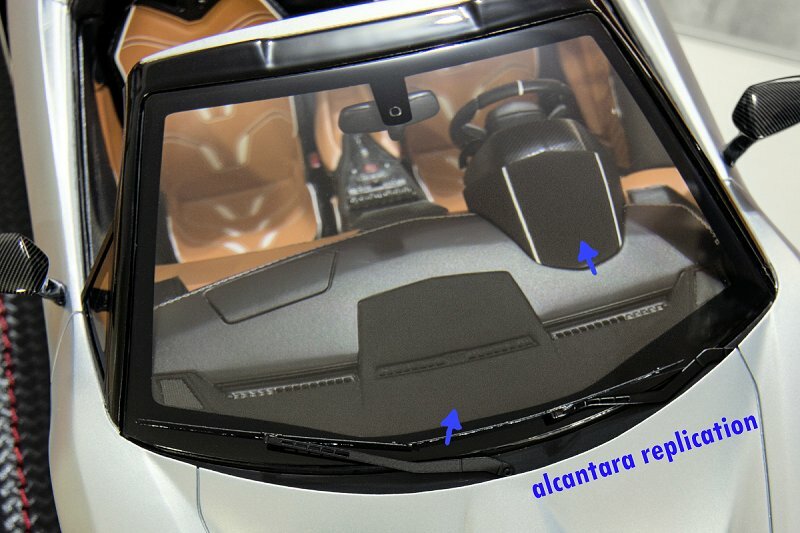 I love the fact that MR is using replication of alcantara on the interior of their new models. It makes the car look like a proper high-end model. 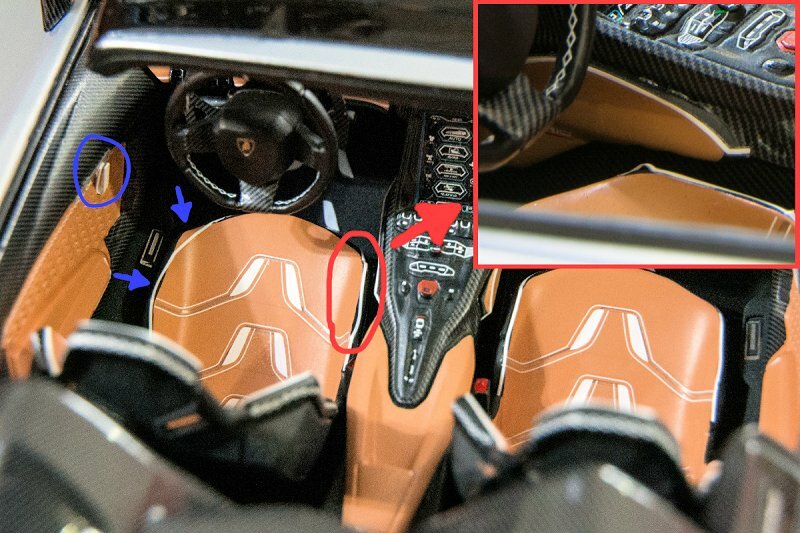 They used this on the floor, behind the seats, on the dashboard panel, and on the cluster cover. Sadly they only applied this on the black parts. Why not go further with this and also try on the colored parts? 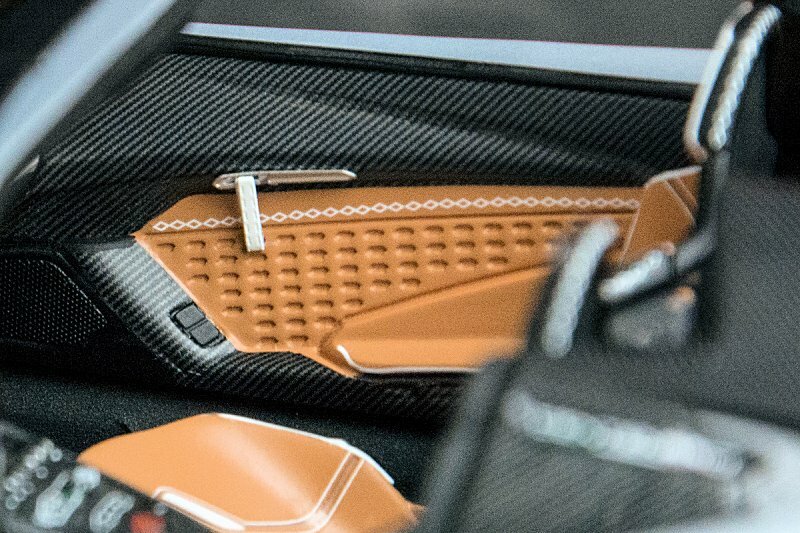 Literally all the tan parts on the real car are alcantara, however MR simply painted all this tan parts instead of also applying their new alcantara look. Door handles are not the best. 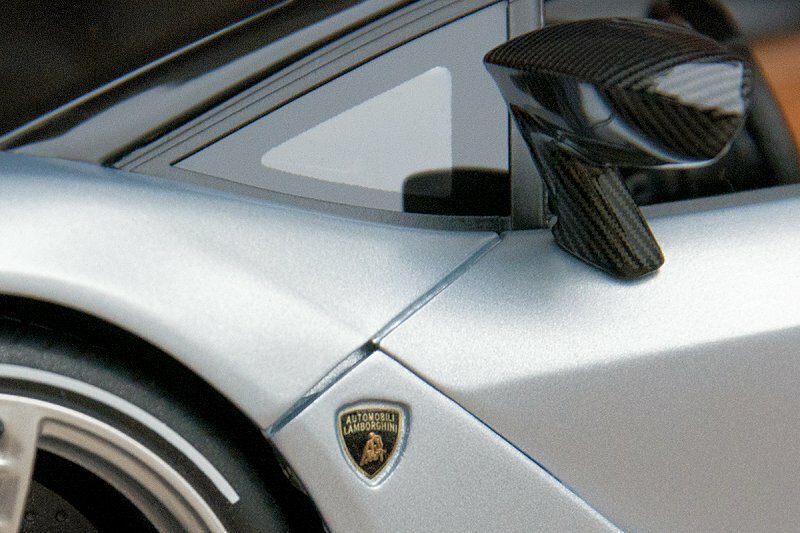 I think AUTOart’s door handles on their Aventador SV are way better. 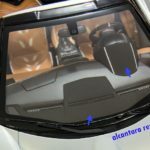 Interior has their new carbon fiber decal which is nice, however all the carbon on the interior doesn’t have any kind of clear coat (either gloss or matt coat) so in some parts it looks rough, specially on the doors. 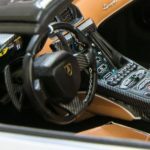 Steering wheel and center console also has carbon fiber, but mostly you’ll notice the doors because they have lots of it. 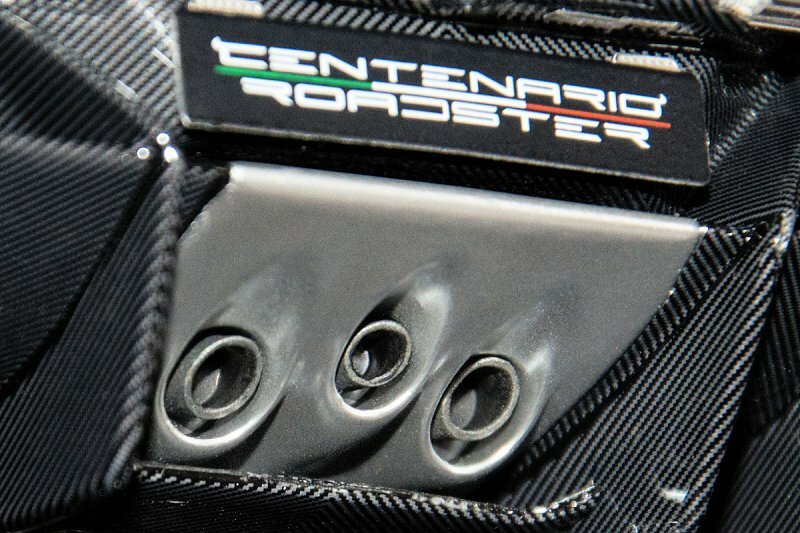 Thankfully, they did the stitching by applying decals instead of making those absolutely horrible holes like they did on their Aventador LP720-4. Sure in a perfect world they wouldn’t do the stitching with decals either, but at least it looks nice. 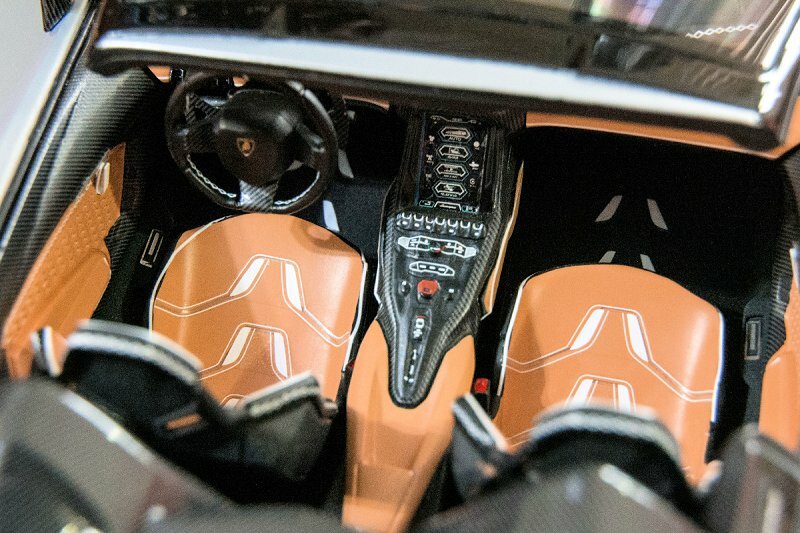 Also thankfully, they didn’t make the center console like on their Aventador models. This one actually looks decent and not like a flat piece. Looks smooth, with nice buttons and fine painting. LCD screen is just a sticker but it looks good. Something I don’t like is that since they used decals, you can see the clear transparent part of each decal on the seats. It looks horrible. They should learn how to print a decal directly, like AUTOart does. 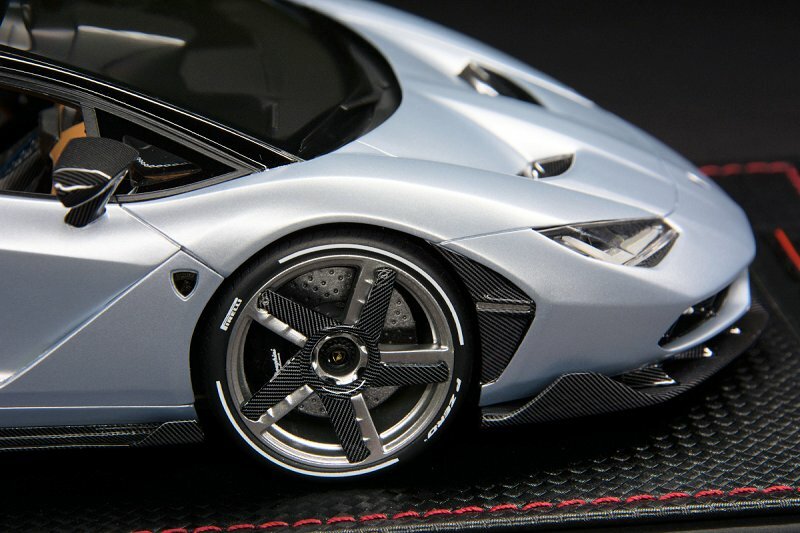 Very unusual rims on the real car, and somehow MR managed to replicate this in an amazing way. I really can’t find anything negative about the rims themselves, maybe they should add some realistic rivets here and there. There’s always room for improvement! 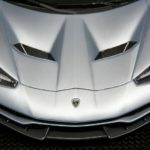 The Lamborghini logos however are not that nice. By the way, remember how the rims look like they’re popping out of the tire on their “old” models? 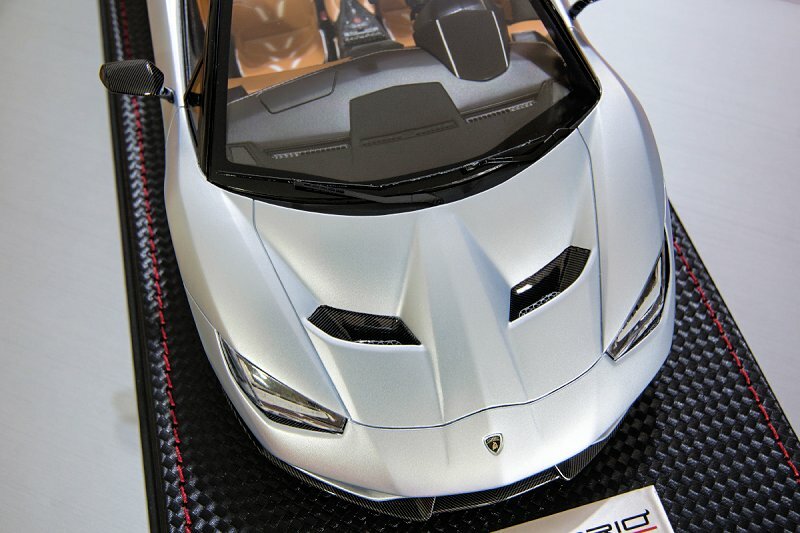 (Example, on their Veneno). This is definitely not the case here. Finally! Discs are nice but made of plastic, just like every other manufacturer out there. However I’ve always loved the finish of the discs that Fronti-Art makes because they don’t look like plastic in any way. The finish on this MR discs definitely makes it look like plastic and they’re not even close as good as the Fronti-Art ones. They’re even kind of glossy. Also the cooling holes are not even holes, they are just textured like holes but you can’t see through them. Not to mention each one of this “holes” are a little bit too big in my opinion. They don’t look correctly scaled. The calipers are good, not much to say about them. The script logos are complete, not like some of their models where they would skip the “Carboceramici” word. If the calipers were in a single category I would score them at 9/10, however I decided to put them inside this same category. 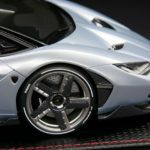 They should learn from Fronti-Art because in my opinion they make one of the best brake disks out there with perfect finish and correct scaled holes. I’ve always loved the Pirelli decals on tires like this! I’m a huge Formula 1 fan so it’s exciting for me to see street cars with this colors and decals on the tires. In this case the white color represents the Medium tires. Anyway MR did them very well, in fact they improved them massively in comparison to their Coupe version. Here the decals look thin like the real car. On their Coupe they are WAY too thick. In fact on their Coupe the Pirelli logo is so big that it’s touching the rim. 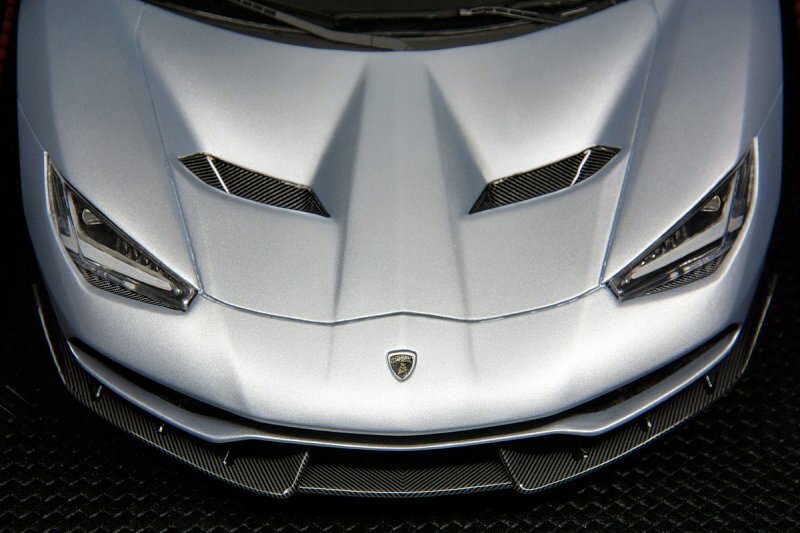 Don’t even get me started about their older models like their Veneno for example. Overall I’m very happy with this part, however like I said there’s always room for improvement, and MR could and should introduce tire sidewall markings, although they would be barely readable. Most has been covered already, but here are some extra details that should be mentioned. * Rear wing looks great, you can even see through it because it has some cuts, just like the real car. 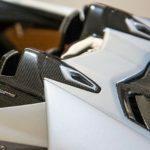 Something resin manufacturers should introduce in my opinion is making a workable rear wing. 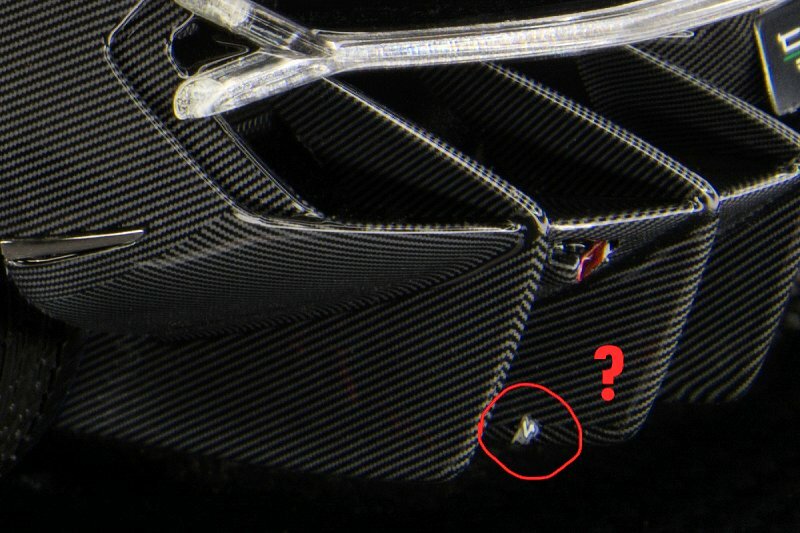 This has always bothered me, how you always have to settle with the wing position the manufacturer decides. Not to mention MR made the Bugatti Chiron with sealed rear wing, and another version with the wing up. What’s up with that? Just make it workable instead of making 2 different molds! Of course their version with the wing up is more expensive and “exclusive”. Sorry MR but that’s ridiculous for me. 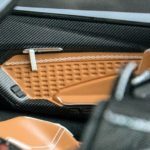 * There’s carbon fiber everywhere, and like I’ve mentioned it looks great! 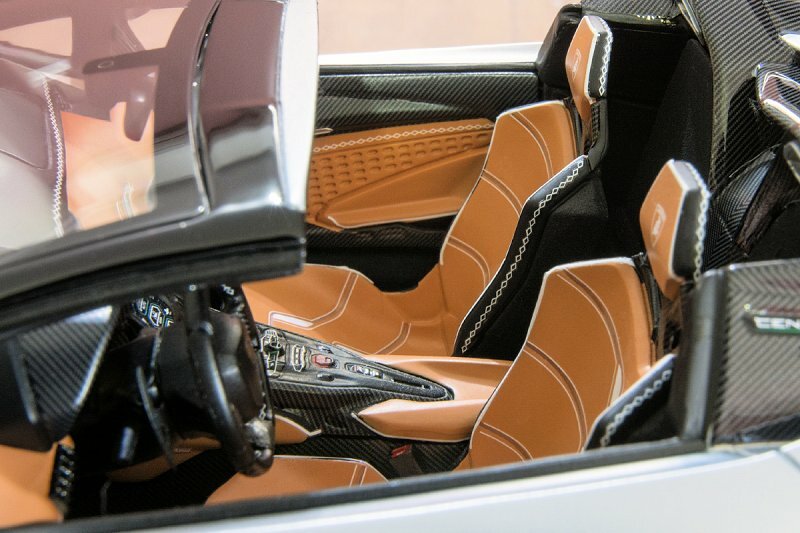 I love the section between the engine and seats where 2 air intakes are located, also filled with carbon fiber. Lots of carbon on the entire rear of the car as well. * There are 2 radiators on the rear, sadly this are plastic. 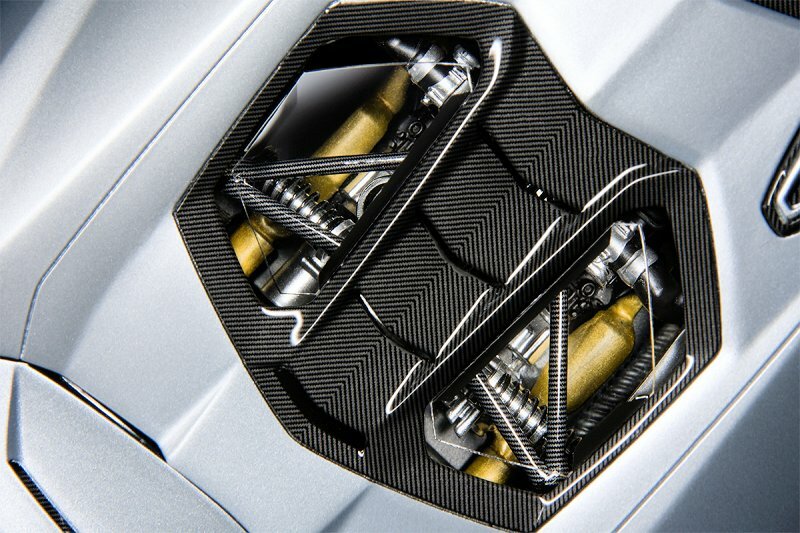 MR could have made them in metal like the ones located on the front of their Huracan Performante, but nope. 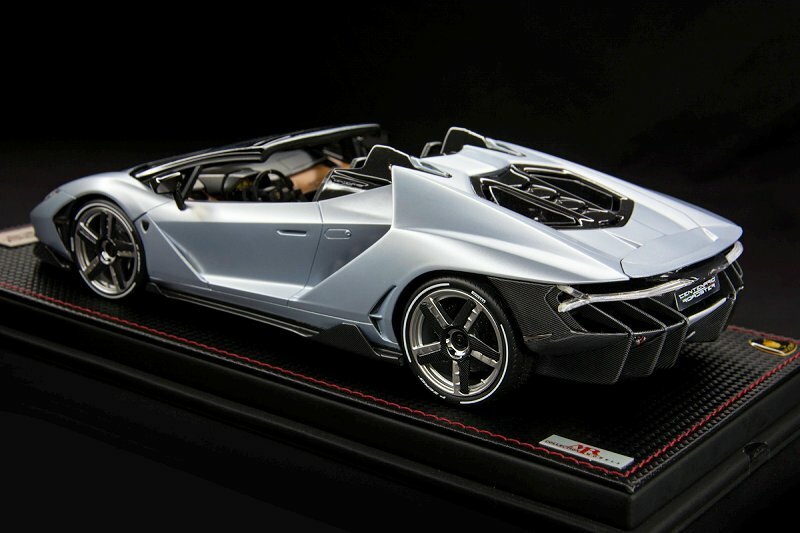 I just checked AUTOart’s sample and it looks the same. 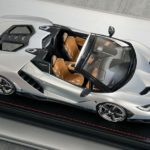 MR what is the excuse for making such detail the same as a model that is half the price? 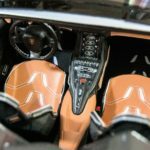 * Air intakes located behind the doors has some texture which is a good thing, kind similar to the radiator’s texture from the rear. 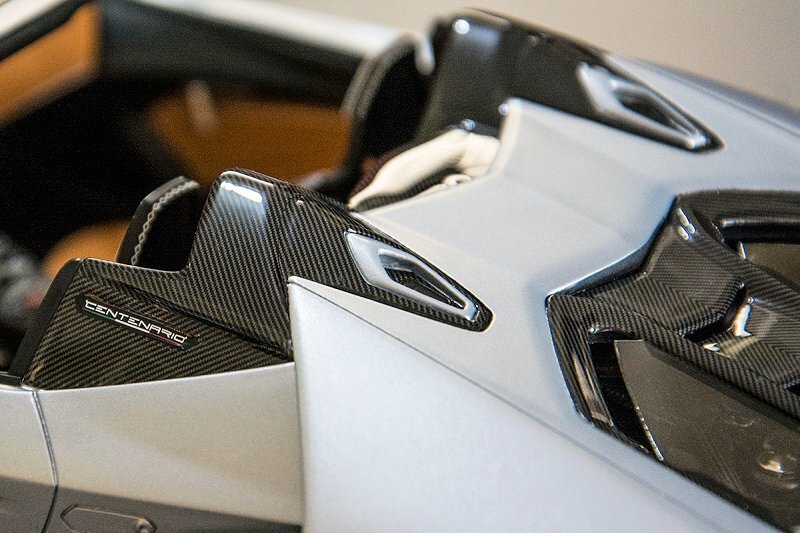 Plus each fin is covered with carbon fiber. 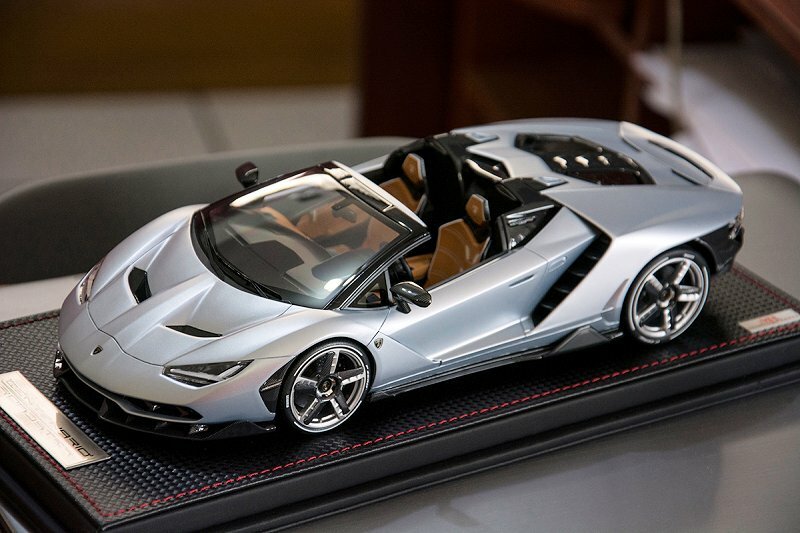 * The Lamborghini logo on the front and the ones located under each side mirror are wrong. 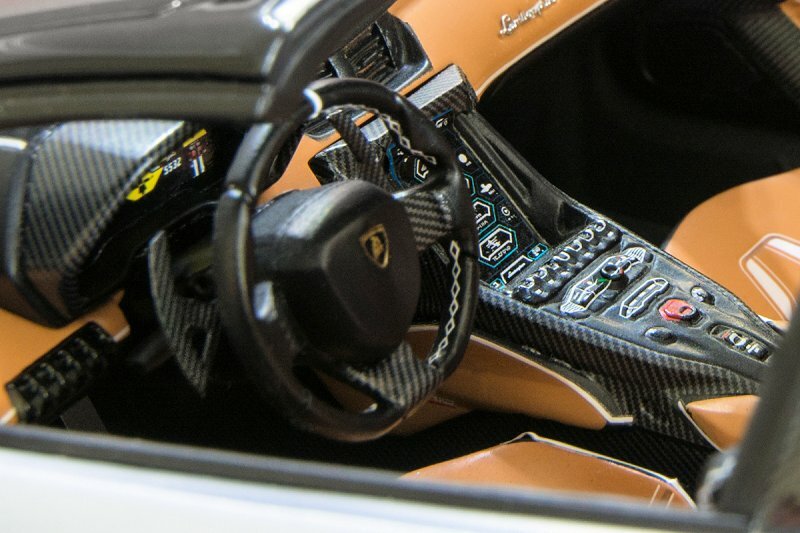 It should NOT say “Automobili”, it should only say “Lamborghini”. Also the bull should be larger. 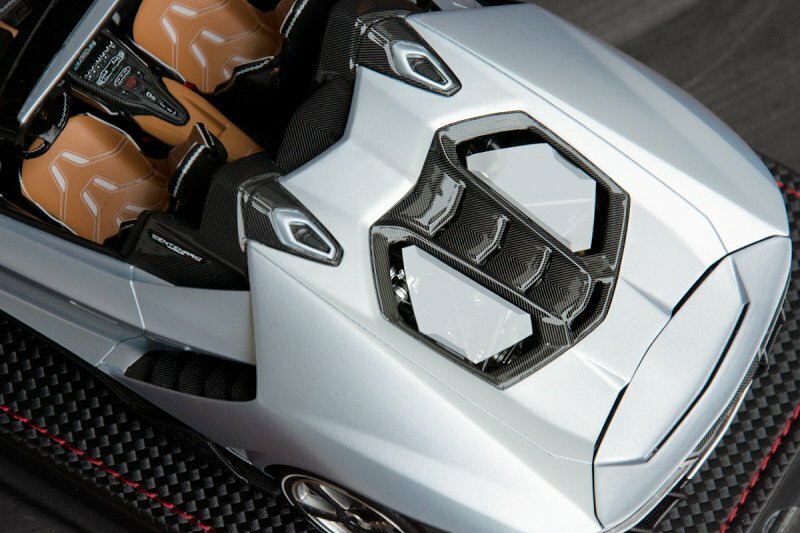 * All meshes are perforated except the very small ones between the rear wheel and LP770-4 logo. * Wiper blades are still a little weird like on their old models. MR is so well known for their awful quality control department (yes they actually have a “department” dedicated to quality control lol). They make such beautiful models but as usual their workers say in their heads “meh, look good enough, probably the customer won’t notice it”. Can I remind you this is a €449.00 euros model? And that’s excluding shipping. * All 4 Lamborghini logos on my 4 rims are misaligned. * Both headlights has some issues. The bulb on the driver’s side headlight is not aligned as the one of the other side. The Y shaped light on the passenger’s side is a little bit crooked. * Lamborghini script logo on the rear came absolutely destroyed. Funny part? They claim it wasn’t shipped like that. * LP770-4 logo from the driver’s side is missing, but not completely missing because I found it glued on one of the rear fins lol. * Little camera on the rear is crooked. * Some details on the rear near to the logo are partially unglued or crooked in comparison to the other side. Looks not only bad but also aesthetically poor. * Driver’s side door handle came partially unglued. * Driver’s side seat came with the decal line that surrounds the edge of the seat completely misaligned. Looks ridiculous. * There’s some weird paint residue next to the center console. * The 3 exhaust pipes are not perfectly aligned, although it’s not really noticeable. * Some scratches on the windshield because somehow they think removing dust with a brush is a good thing. I spent A LOT of time removing dust from the model before pictures, and then in Photoshop I removed more dust, specially the rear. They should not work in such a dusty place so the models would stop arriving like this. I remember when they sent me a picture of an Atelier model that they were making for me and the workplace was a huge room with many things all around. Kind of messy, and many different entire productions being made in the same room. With people in shorts. Again something they should learn from Fronti-Art, those models arrive in the best presentation ever. The interesting part? I’ve seen worse on other MR models. Almost an 8 which is not that bad, but should we even use the phrase “not that bad” when reviewing a €449.00 euros sealed model? No model in the world is perfect and that definitely applies here. That doesn’t mean they shouldn’t try to be perfect, some of the negative points are just silly, literally. A score of 3/10 because of quality control issues is absolutely ridiculous, and I wasn’t harsh enough to be honest. However I find this to be one of the best MR models ever made, only if it didn’t have those issues. Since I may try to fix some of this things, I’m still happy with the model and if I ever sell my entire collection, this could be one of those very few models that I would actually keep, mainly because of the paint job and because I love the real car in this color combination. I also love my Coupe, but this Roadster is actually improved. 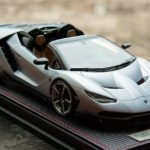 13 Responses to "REVIEW: MR Collection Lamborghini Centenario LP770-4 Roadster"
Great review, thanks for sharing! 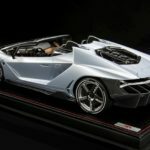 At over $500CND this model should arrive near perfect. It is laughable at some of the QC issues you mention. Did you have a 1:1 with MR on this? Wow, that quality control is shameful. Thank you for such a thorough review! I’m so sick of having to take care of QC issues, including either sending models back or fixing the problems myself It’s anxiety inducing unpacking models from certain brands knowing that there’s a good chance that there will be problems and an ensuing headache to take care of them. Some models companies I avoid completely, and thanks to your review I’ll have to add MR to the mix. 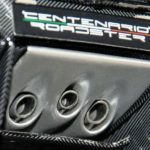 To me, it is incredibly disrespectful on the part of the manufacturer to try to pawn off damaged and poorly produced goods – especially with such high price tags. If this is what they think of their customers then they really don’t deserve our business. Can I join in congratulating you on and thank you for this very detailed review. It strengthens my resolve not to buy MR models. They´re simply hopelessly overprized for what they are. Awesome review. Would be interesting to know if MR will have a „Lessons Learnt“-Department in the near future 😉. They’ve had QC issues since the early days so lesson learnt doesn’t not exist in their vocabulary. 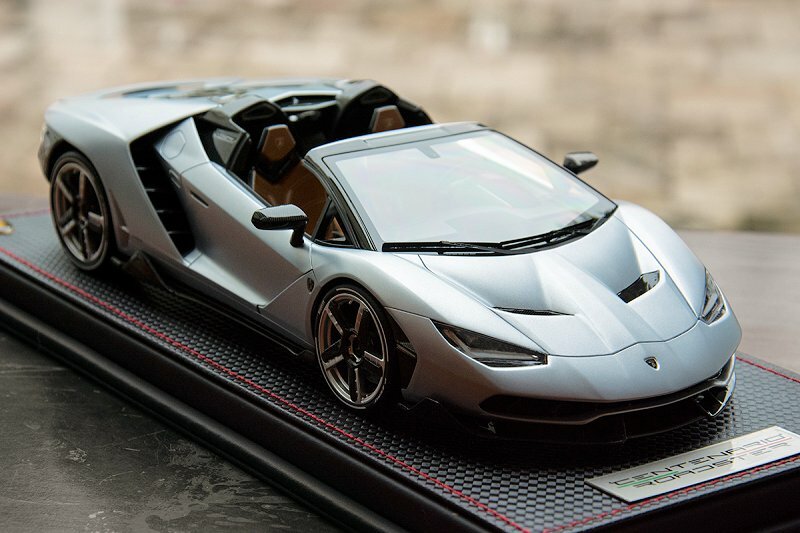 I’m planning to do the Performante review next week possibly. 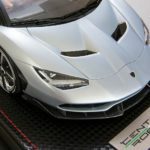 I don’t think I’ll review the Frontiart Veneno since it was barely in production and not known by many people, plus it’s more expensive than usual Frontiart models. Let me begin with the fact that the quality issues are a shame for a company that qualifies itself as “one of the best in the world”. Although Italians hold a different meaning to quality control then most, this is not acceptable. Having said that, I bought the same model from them and although not free from it, it didn’t have any of the issues mentioned here. And I have never bought a model from MR with dust on it. It sounds a little bit cheap to say that it didn’t leave the plant like that, but it’s not entirely impossible. I have a similar experience (not MR) and I’m absolutely sure someone between start and finish had a look and feel without knowing what they were dealing with. About the review: I’m not sure that using the ultrafine comb for finding issues on a model is the way to go. You may expect more for the price, but when do you cross the line? If you do this with any other midrange priced model, it will end up as utter crap. As you yourself said, perfect does not exist. But shouldn’t you ask yourself this: am I even looking for perfect? I know for a fact that it did leave their factory like this. MR Models now comes sealed from factory (not only the box but inside, the display case comes sealed). My dealer which is probably their biggest dealer talks to me directly for every order and he refuses to open the model because he says that it won’t be 100% new anymore, although after this he agreed to open them from now on. Anyway I know no model out there is perfect, and without the QC issues this would be a very decent model. And yes for sure I’m not looking for perfect, but I’m looking for near-perfect models, specially at this price. 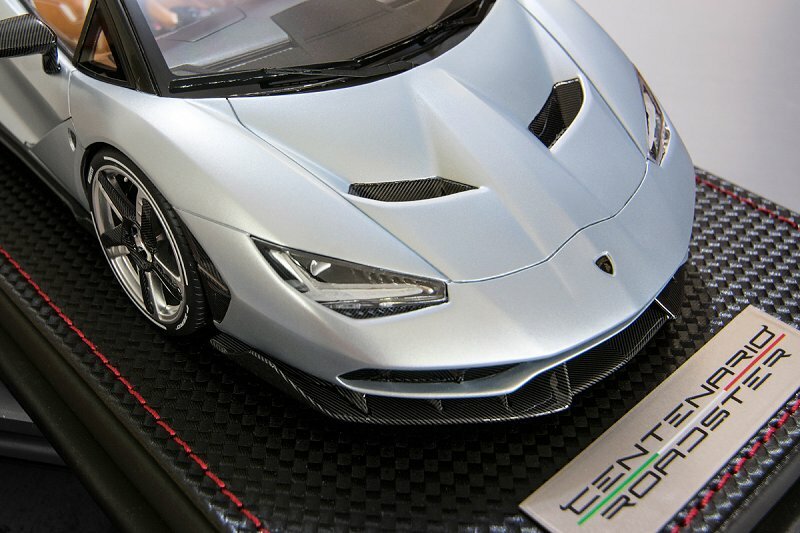 I can easily tell you how near-perfect the Koenigsegg One:1 by Frontiart is, at least the sealed one. Tbh it’s quite funny for me how a brand like this with this prices can make brake discs like the ones on their new Bugatti Chiron, and of course the mentioned QC issues. Maybe You should check model before pay. Most of shop in japan allow buyer inspect model. Especially on high price item.